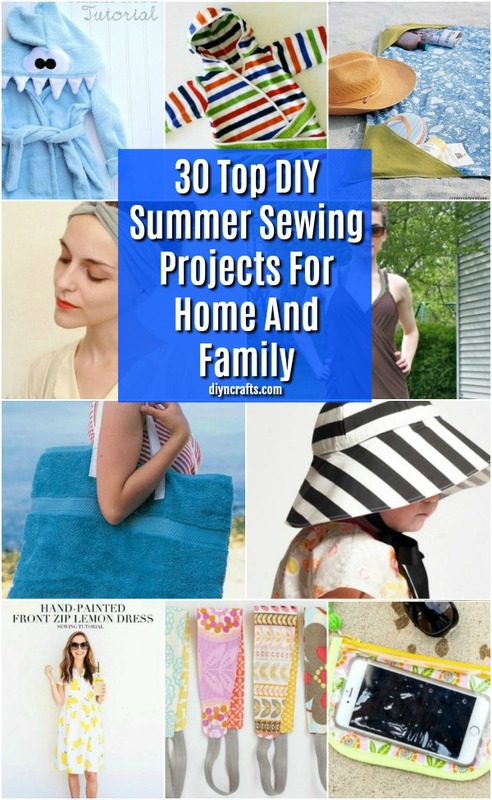 Home » Fashion » 30 Top DIY Summer Sewing Projects For Home And Family – With Free Patterns! 30 Top DIY Summer Sewing Projects For Home And Family – With Free Patterns! I absolutely love a good, easy sewing project. With summer coming up, I recently began looking at lightweight fabrics and wondering what projects I could use that fabric for. I wanted to make some things for my wardrobe and maybe some home décor, too. So, I gathered a list of the 30 top DIY summer sewing projects for home and family. All of these are free patterns and they are all so easy to sew! Whether you are a seasoned sewing machine user or you are just getting started, you will be able to make every DIY sewing project on this list! I’m not a professional seamstress by any means, so I always look for simple sewing projects. All of these are considered easy and perfect for beginning sewers. There are some great dresses, coverups for the beach, and even a few beach accessories like towels and totes. And, there are even a couple of DIY bathing suits that you can have sewn together in just a few hours. Forget about paying top dollar at department stores for your summer essentials. You can just sew them yourself! And, whether are a beginner or an expert at sewing, you really need to check out these 900 plus free sewing patterns. There is something in here for everyone. I really love sitting at my sewing machine and creating something new and exciting and I can’t wait for you to try out some of these new patterns. There are some adorable things for the kids and some really smart patterns for keeping your phone safe at the beach and even some lovely home décor. If you love sewing, or even if you are just getting started with the craft, I know that you are going to love these patterns. And, be sure that you take time to look over these 80 ingenious sewing hacks and pro tips that will make all of your sewing projects so much easier. This gorgeous beach coverup can be sewn together in must 20 minutes! It is so easy and you can make it to perfectly match your bathing suit. It is so hard to find a good coverup, especially one that doesn’t cost a small fortune. This one is perfect and you only need a little less than two yards of fabric to make it. It’s very stylish and it’s so easy that you are surely going to want to make one of these for all of the girls in your house. 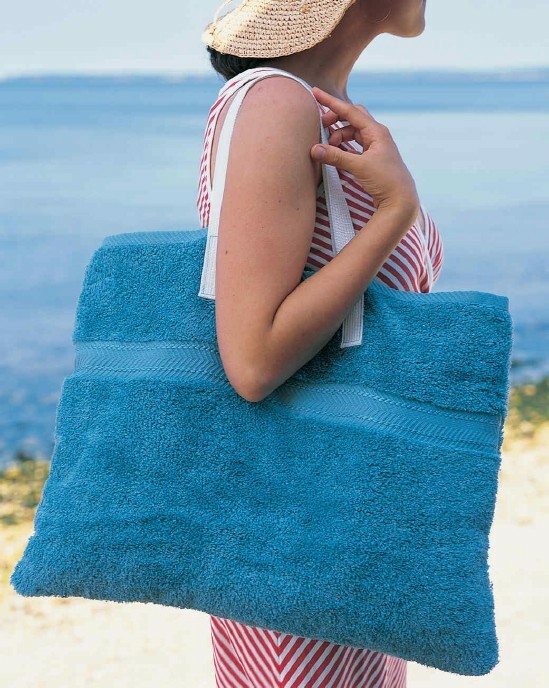 A couple of bath towels are all you need to make an amazing beach towel mat and tote. This is an all in one! You can use it to carry all of your beach essentials with you and then use it as a beach mat while you are at the beach! How amazing is that? Plus, there is a nice little pocket, which you can totally stuff with something extra soft to make a nice little pillow. 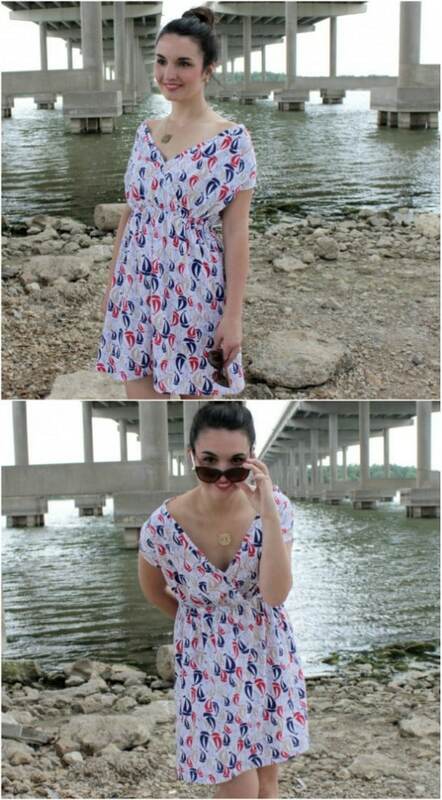 This easy to sew boat club dress doubles as a swimsuit coverup. You only need about a yard and a half of fabric and of course, your sewing machine. This is a simple project that you can complete in an afternoon and it gives you a lovely dress to wear to those summer parties that you can also use as a fashionable coverup for the beach. You always want to make sure that your little ones are covered when they go out into the sun. 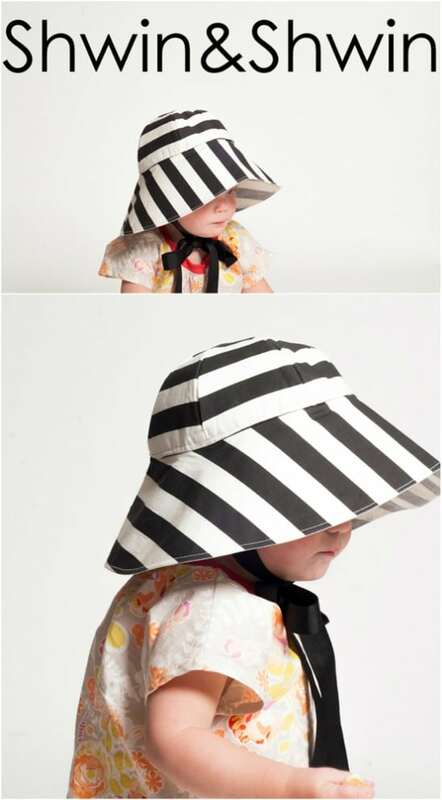 This DIY child’s sun hat will keep the sun from burning their little faces and heads and it is really simple to sew. You can adjust the pattern for the right size but this one mostly fits all younger children just the way it is. I do love free baby clothes sewing patterns. 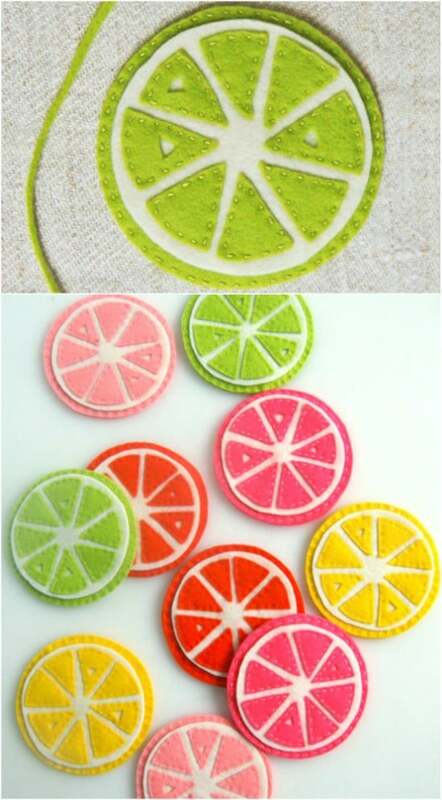 You can make an entire set of these lovely citrus coasters in no time at all. These are really simple and you make them from felt, using embroidery thread to sew them all together. They are so colorful and virtually scream summer. Make a set for yourself for those outdoor parties and make another set for someone special as a gift. They will love them as much as you do! You don’t have to spend a fortune at the department stores this year outfitting the girls in your family with a new swimsuit. With this free pattern, you can make your own one piece swimsuit and save that extra money to spend on vacation. You can easily alter this pattern to fit all of the girls in your life and when you DIY your swimsuit, you can choose any color or design that you want! 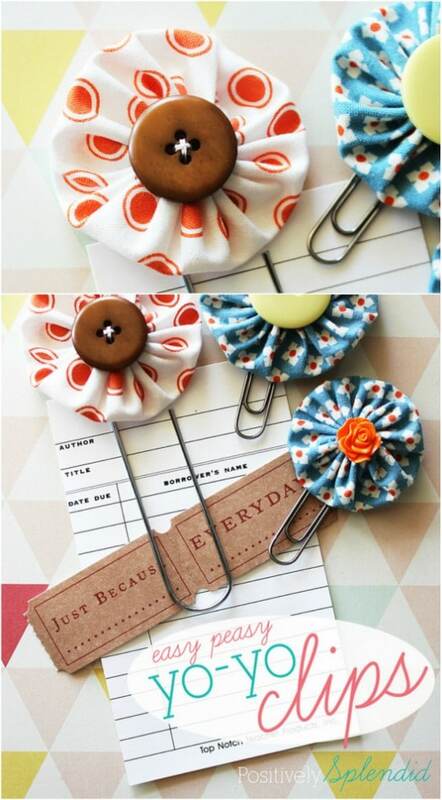 Dress up your office for summer with these simple to make Yo-Yo clips. The only actual sewing that you will have on these is putting on buttons and other trinkets for the centers. Aside from that, you just glue the little flowers onto paper clips. You could also do these on bobby pins and make adorable little summer hair clips for your girls. 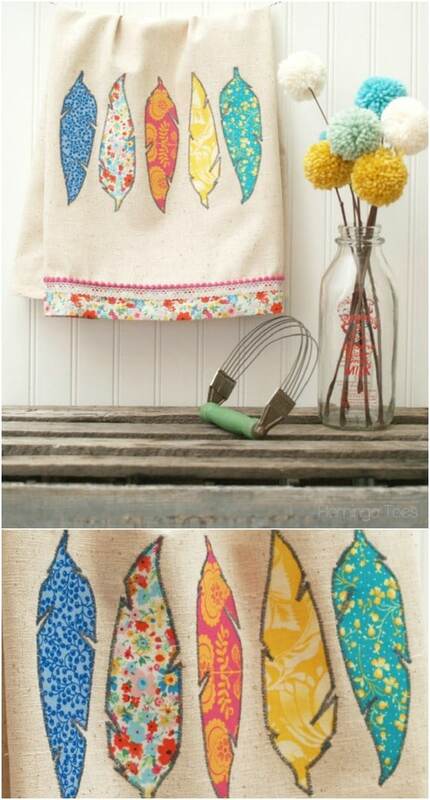 Even your kitchen needs a little extra decoration for summer and these DIY fabric feather dishtowels are a great addition. These are super easy to make and they dress up those otherwise boring dishtowels and make them summer ready. You could also do other designs, aside from feathers, if you prefer. You just have to cut your fabric into the shape that you want. 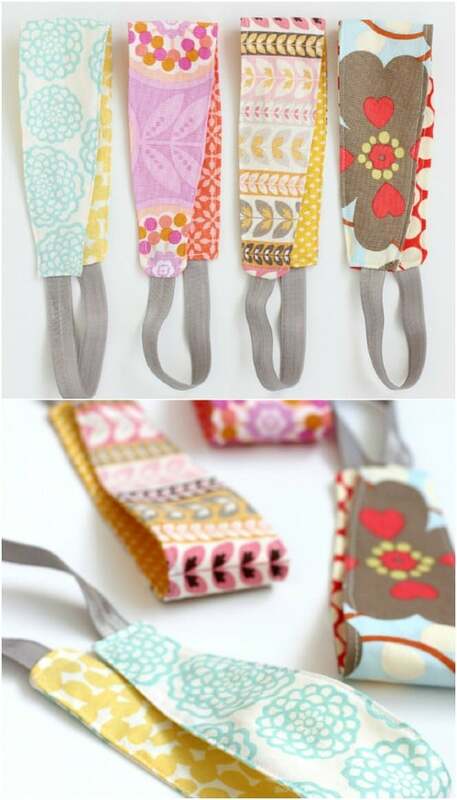 This is a great way to use up those leftover fabric scraps. 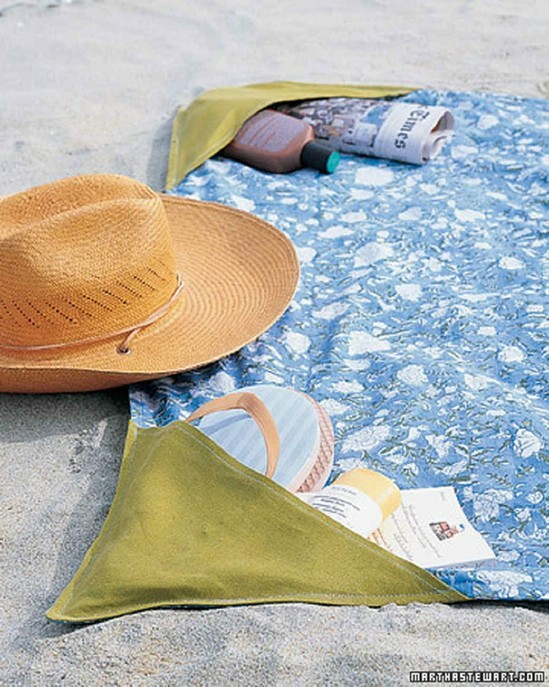 Imagine a beach blanket that will hold all of your sunscreen, sunglasses and anything else that you may need while at the beach. You can sew your own and it only takes a few minutes. You will need a beach towel and an old sheet to make this one. It’s super simple and if you don’t have a sewing machine, you could do this one by hand just as easily. My kids have always loved those little freezie popsicles, especially during the summer. Of course, they can get really cold to hold and often make a mess. With these easy to sew koozies, you can avoid the mess and the really cold hands. These are perfect for taking along to the beach or just having on hand at home and it only takes a few minutes to make each one. 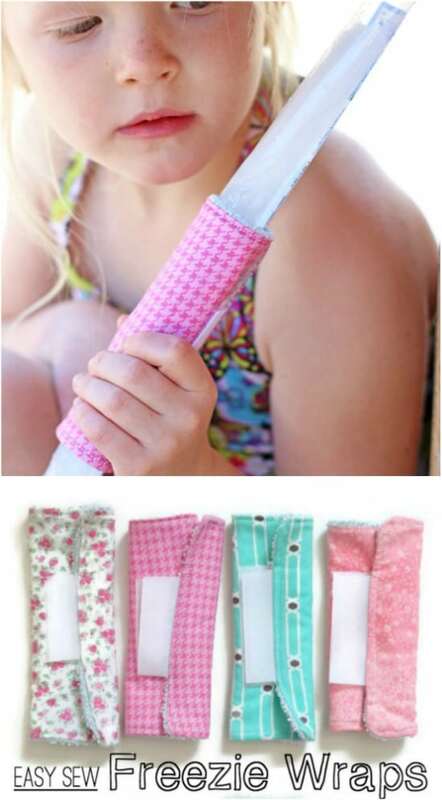 You could even adjust this pattern to fit your homemade popsicle recipes. 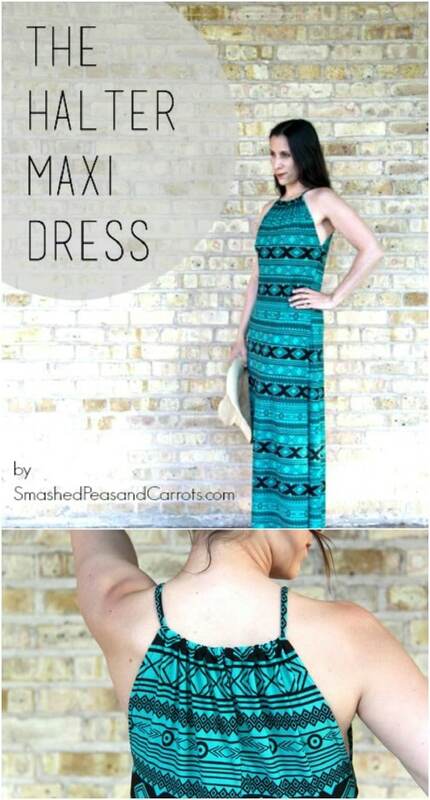 Maxi dresses are all the rage right now and while you can certainly get one at any major department store, this DIY handmade halter maxi dress is much cheaper than anything you can buy, but it looks just as fashionable. This one is super easy and only takes a little over two yards of fabric. You could do several of these in different fabrics to have maxi dresses for all of your summer events. 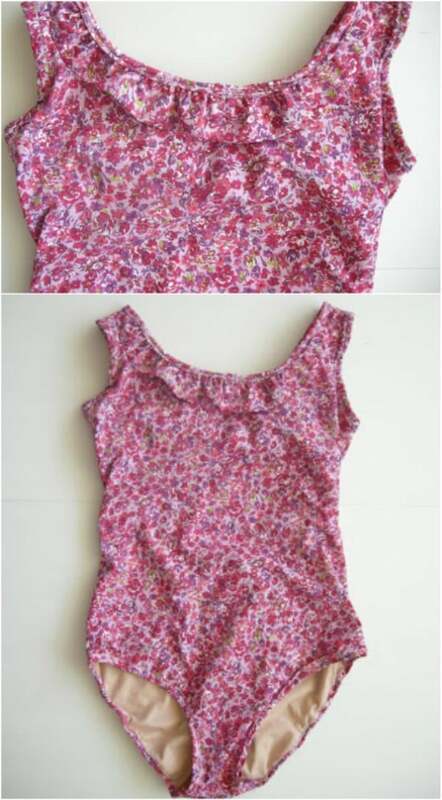 Not only do you sew this adorable summer dress all by yourself, you also create the design by stamping it. 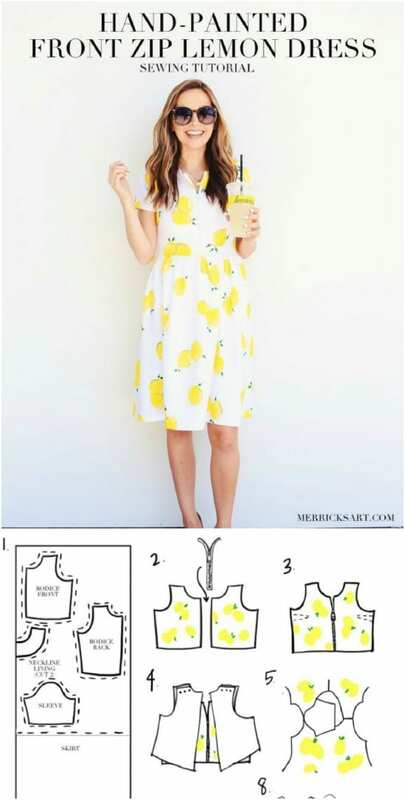 Lemons are an excellent choice for summer and if you choose a lightweight fabric for this one, it will literally be the coolest dress on the block. It’s really simple to sew, even including putting in the zipper, and you will have so much fun stamping those little lemons all over it. If you are planning any sort of road trip this summer, this DIY lap desk is a must, especially if you have little ones. 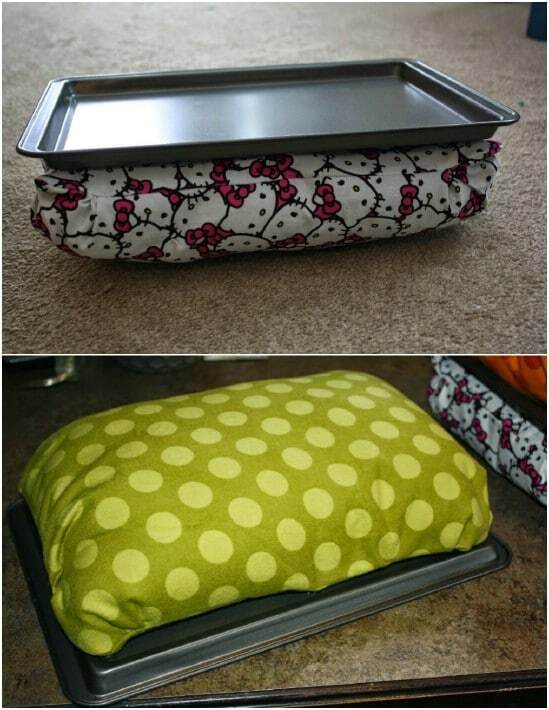 You make this with a cookie sheet for the desktop and fabric and stuffing that make it comfortable to use. This is so simple and it will certainly help your little ones to color, play or even eat in the vehicle while you’re on the road. Summer is the perfect time for picnics and this DIY roll up waterproof picnic blanket is the perfect thing to take along on those outings. This is really easy to sew – it will only take you an hour or so from start to finish, even if you have never sewn much before. It’s waterproof which makes it perfect for the beach, too and it’s big enough to seat several people when it’s finished. 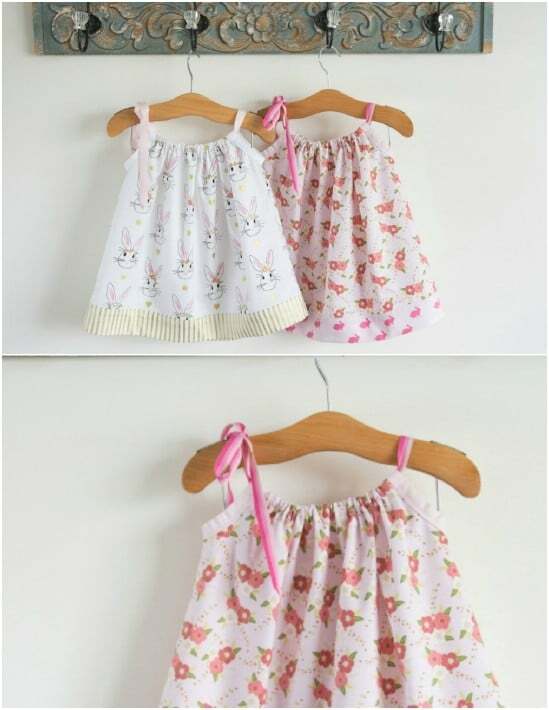 I adore these little pillowcase dresses for little girls. These are super easy to make and they are so cool in the summer. They’re great for outings, church, or anywhere else that you need to go and you only need a single pillowcase to make each one. You could do a couple of these in a day’s time and fill her little wardrobe with the most adorable dresses! Headbands are great in the summer – I mean, they’re necessary when we’re cruising along in a convertible, right? These DIY headbands are reversible so you essentially get two in one and they are really quick and easy to make. 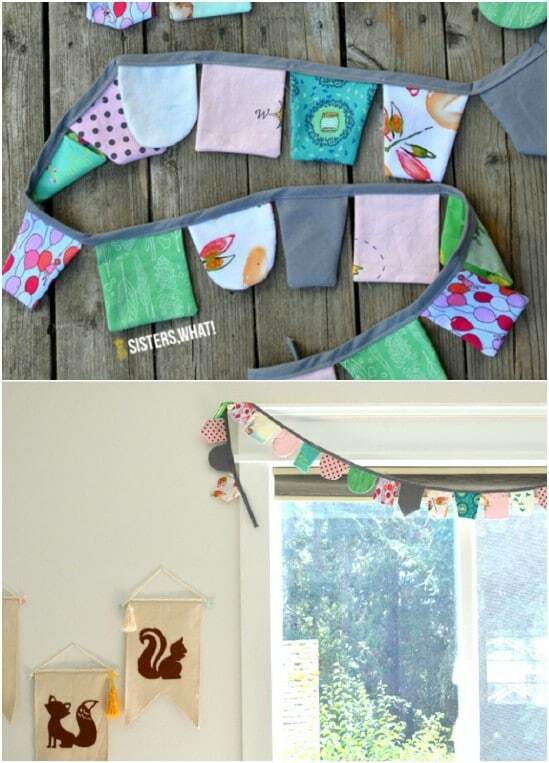 This is a great project if you have a lot of scrap fabric pieces that you want to use up and you can make them in sizes to fit yourself or your little ones. This little bag is a must for the beach or any road trip that you plan on taking this summer. 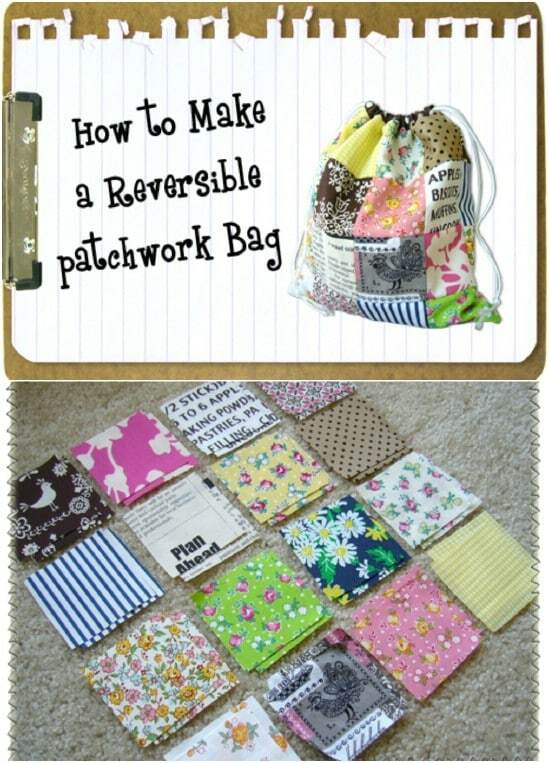 It’s reversible, so it will literally go with everything that you may be wearing and it has a gorgeous patchwork design, which you may from quilting fats or that pile of scrap fabric that you’ve been looking to use. This one takes very little time and it’s a really roomy bag when it’s finished. I love making my own DIY tote bags! 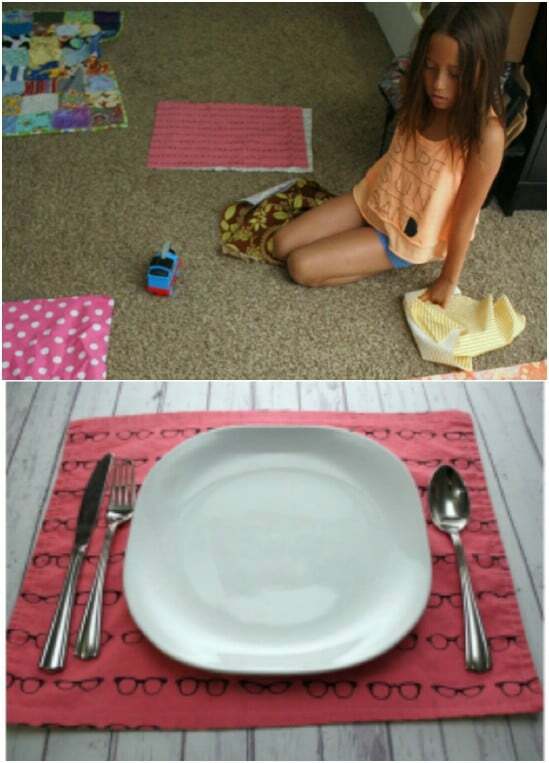 In just 15 minutes, you can sew together one of these super summery reversible placemats. That means that in a day or so, you could have enough of these for all of your outdoor summer entertaining. They’re reversible so you could do a patriotic theme on one side for the summer holidays and then something beach related on the other. The possibilities are endless! If you are planning to host any outdoor parties or cookouts this summer, then this DIY scrap fabric banner is a must for you to sew. You can make this with those old quilting pieces that you have left over from other projects or any fabric scraps that you may have on hand. It’s a really simple one to sew together and it gives your outdoors so much decoration. 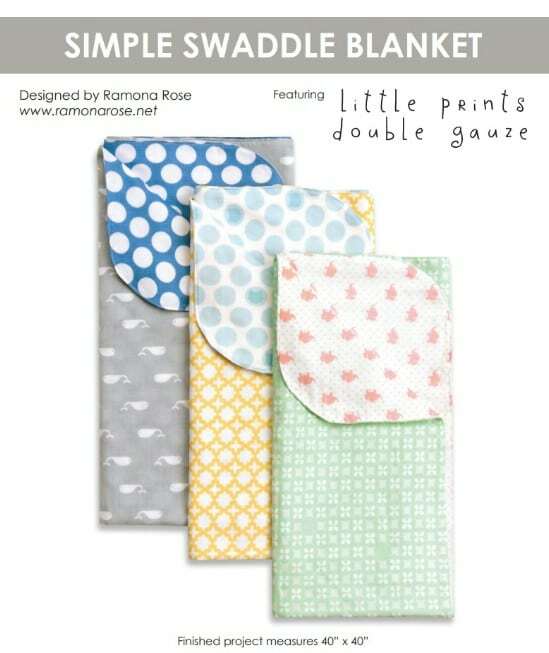 Whether you have a new little one or you know someone who does, this summer weight DIY swaddle blanket is perfect for those hot day outings. These would make wonderful gifts for upcoming baby showers and they are simple to sew, so you can make one for all of your friends who are expecting. 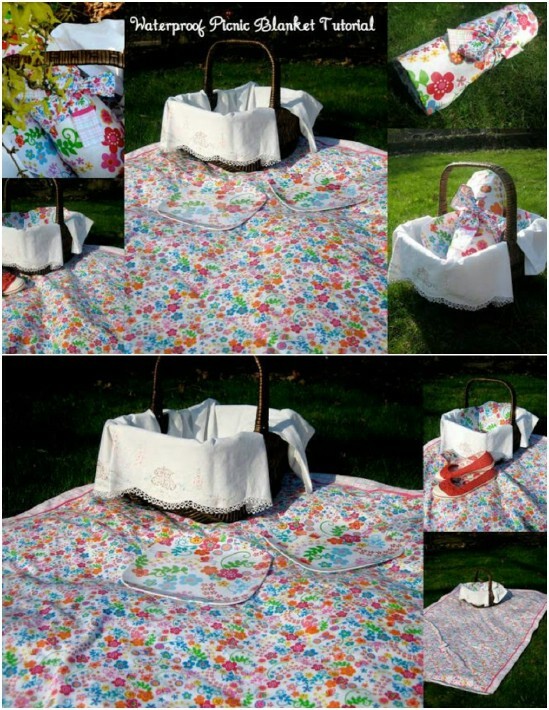 They are just the right weight to keep baby sheltered yet cool this summer. Summer in my house is filled with travel, which means lack of sleep. I have so much trouble falling asleep in a strange place, especially when there are hotel lights right outside. That’s where this hand sewn summer sleep mask will come in. This one is really easy to do and only takes an hour or so to complete. 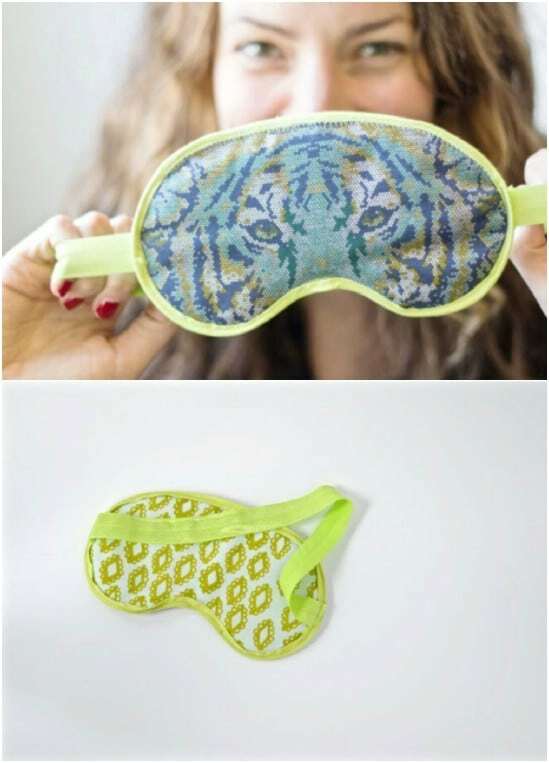 If you tend to have trouble falling asleep because of lights, this is perfect for taking along on those summer trips. This would also make a wonderful hand sewn gift. If you plan to spend any time at the beach, lake or pool this summer, you definitely need this DIY waterproof phone case. 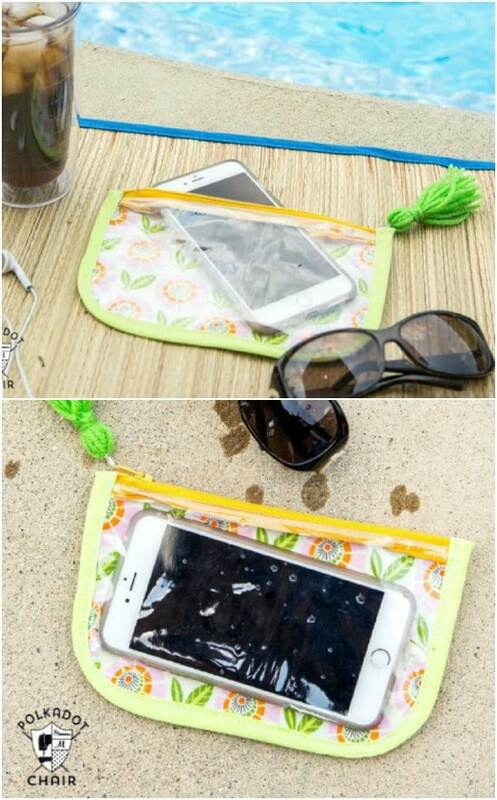 This will keep your phone safe and dry, and protected from sand and other outdoor influences. It’s really easy to make and takes very little fabric. It’s big enough to store your phone safely as well as your keys and other things that you need to take along. 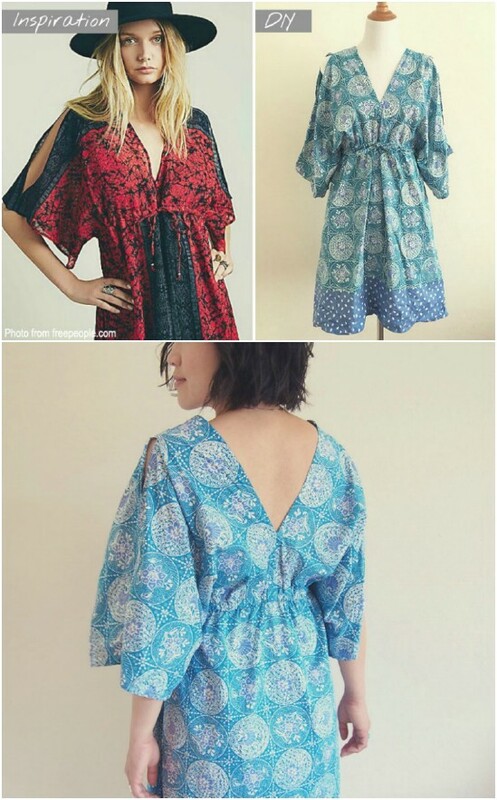 This gorgeous DIY boho dress is inspired by the ones sold at Free People for over $100. You won’t pay nearly that much though when you sew your own. This pattern is super easy to follow and you could do these in different designs or even toggle the length to have an entire wardrobe of boho dresses for summer. You could have several for the cost of buying just one at Free People. If you plan to go to the beach or pool this summer, you will definitely need a good summer tote. This DIY summer tote can be sewn together in no time and it is perfect for holding all of your summer essentials. You just need about a half a yard of fabric and then another quarter of a yard of coordinating fabric – or you could do a contrasting fabric if you prefer. If you tend to wear bikinis to the beach or pool, this DIY two piece bathing suit should definitely be in your sewing to do list. 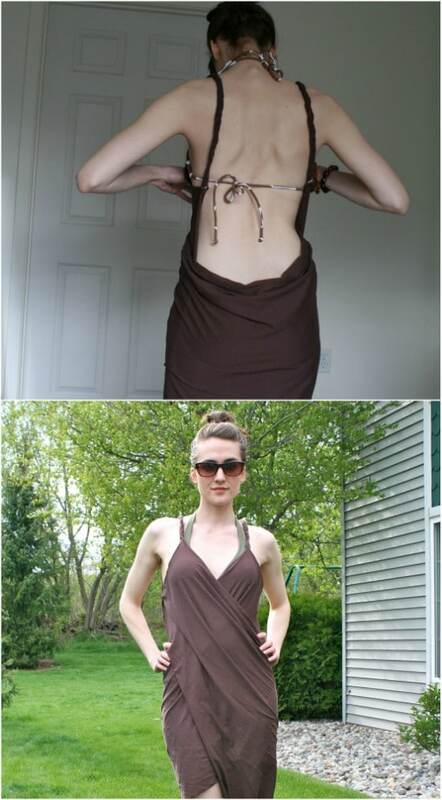 This is a very flattering bathing suit and it is really simple to sew. If you need more than one bathing suit, just make a couple of these in different colors and patterns. You can have one finished in just a weekend or less. 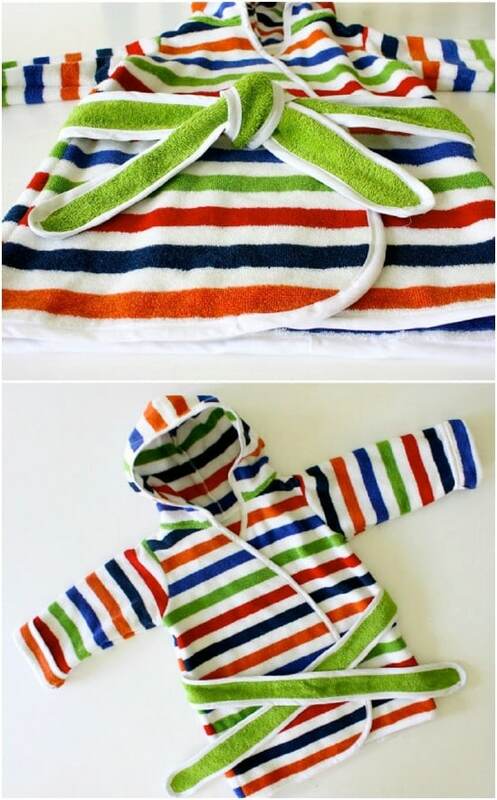 If you have a little one, or know someone who does, this little terrycloth robe is a must for summer swimming. 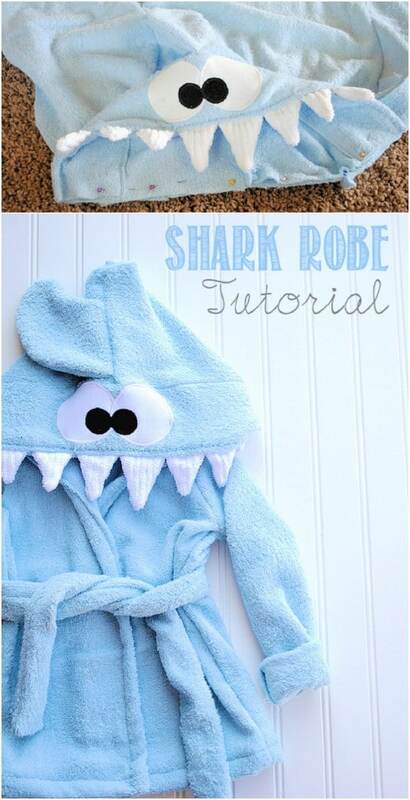 It’s hooded and it ties around the middle, and it could not be easier to sew. This would make a wonderful baby shower gift and it’s also great for bath time. If you have more than one little one or shower to attend this summer, make a couple of these. You can finish one in just a few hours. 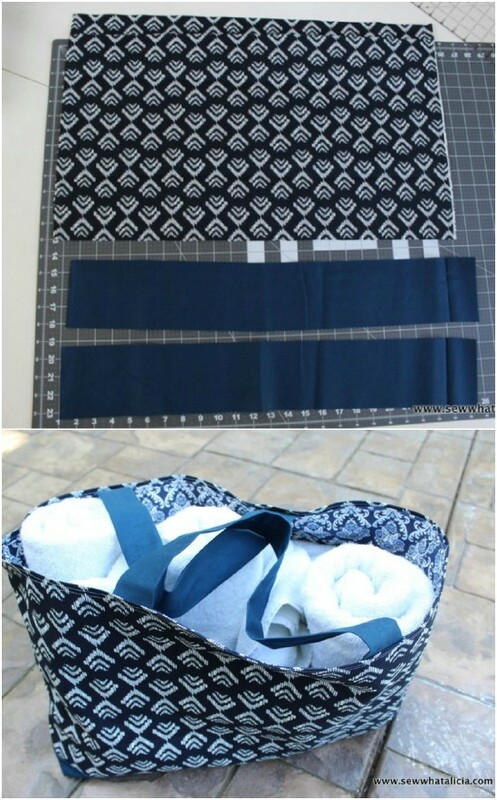 This little towel wrap is going to be perfect for vacation. Whether you use it after your spa day, after a shower or at the beach as a swimsuit coverup, you are going to love how easy this one is to make. And, it has a great little pocket right in the front. I really do love anything with pockets. Take those old t-shirts in your dresser – or your husband’s dresser – and turn them into the perfect little summer t-shirt dress for your little girl. These dresses are really easy to make and you can use different t-shirts in different colors to create a nice little contrast. Best of all, these are completely free to make as long as you have some old t-shirts to use or you could check your local thrift stores and pick up a few in different colors for about a dollar each. I love t-shirt upcycling ideas! 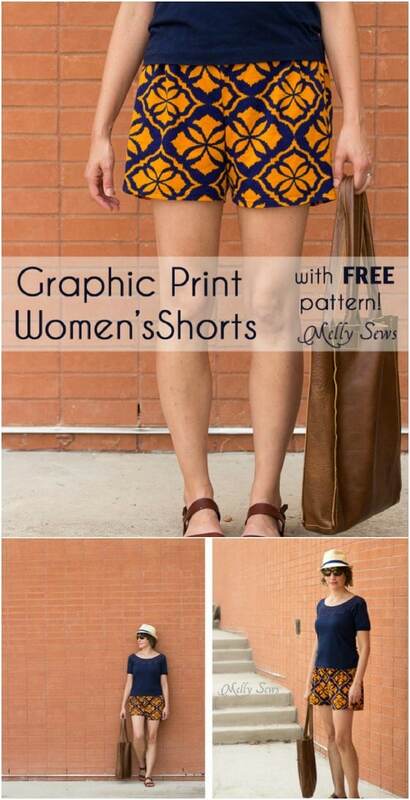 Shorts are a must for summer and you can create an entire wardrobe with just this one pattern. Just grab some fabrics in different textures and designs and sew yourself an entire new summer wardrobe. These shorts are so easy to sew and they are so much cheaper to DIY than they are to buy in a department store. 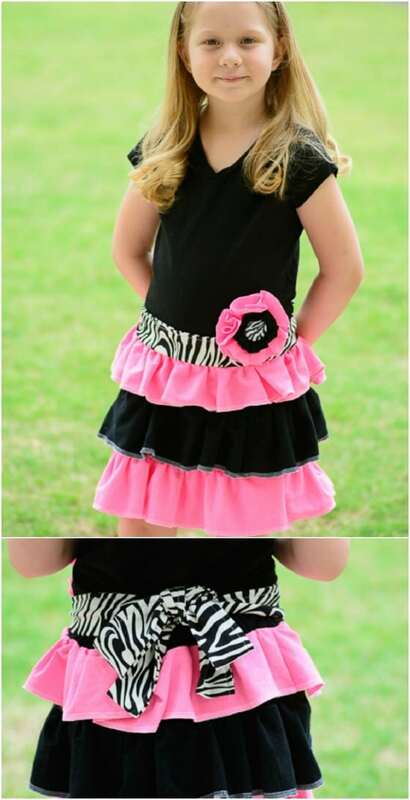 You can even adjust the pattern to fit little girls. During summer, I love nothing more than to keep my hair up and out of my face. I want to feel the sun on my face, not my hair! 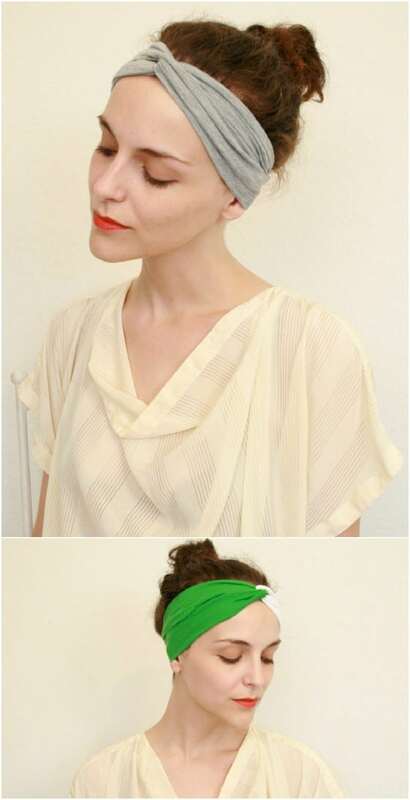 That’s why I love this DIY turban headband. It will definitely keep those locks up where they belong and this is a really easy headband to sew. You are going to love how this looks when it’s finished and you can do different colors and designs to make headbands for summer fun in the sun and those fancy nights out on vacation. Hello! i, see bright, simple to make sewing idea’s! “really ,lovelly” & yes, would a killing in a little shop-place or boutiuqe. I,was thinking of getting myself a hobby of sewing simple clothing for myself and future family someday again. This is one of the most wonderful sites. It covers everything & every site.& you do not have to go to 50 other sites to get to the one you want.